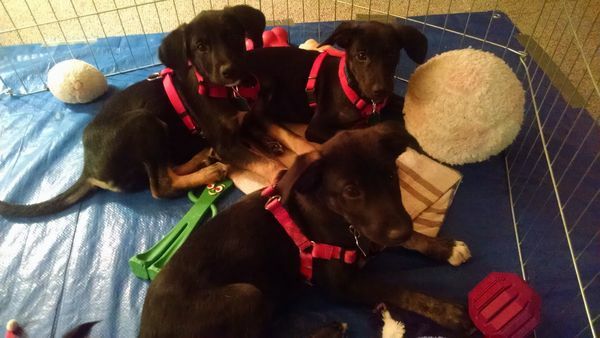 We are expecting three little house guests tomorrow evening; three little puppies from TCSPCA that are coming into JFK tomorrow evening. The bad news is that we are also expecting SNOW (!) the whole time I will be driving to the airport, meeting the couriers, and driving home I really thought we were done with the snow by now and just put away my snow shovel and boots. There isn't much that could prod me into driving to the airport in the snow.. except these puppies :-) Cheynie was helping me get ready for them tonight As soon as she sees the tarp and the xpen come out, she starts looking to see where the puppies are! 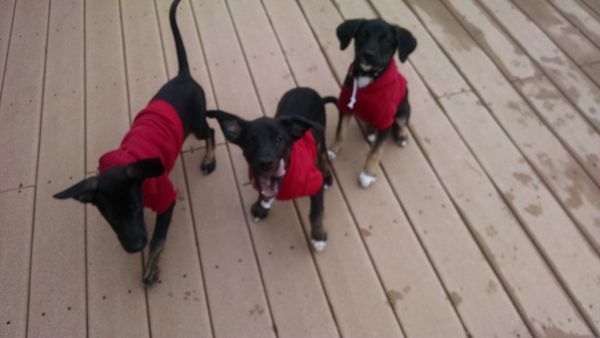 Pretty soon people are going to blame you for bringing the snow with your puppy rescues! Can't wait to see the new ones. Great puppy news...but be careful with the drive in the snow. Someday soon the snow will be gone. I hope! Awww... Cheynie is a sweetheart. Good luck with the new pups, and drive safely. The look on Cheynie's face says it all!! You can tell she can't wait for the puppies to get there, lol. Hopefully there won't be any snow for the drive. Are they there yet? Did they arrive safely? They are gorgeous pups!!!! I am glad they made their way to you safely.